Culture - Arts - Alamos Mexico! Alamos Alamos is a cultural center that attracts artist and admirers of the arts with its many festivals, art openings, operas, and theatre. Events are planned year round and center around the Plaza de Armas and the MUSEO COSTUMBRISTA de SONORA. The ‘ Estudiantina’ is a group of young men that join to sing traditional songs using string and percussion instruments, dressed in traditional troubadour clothing of 13th century Spain. Alamos is proud of the “Estudiantina” who stroll the streets in song followed by a tequila carrying Burro on evening “callejoneadas”, street processions, during events and celebrations. 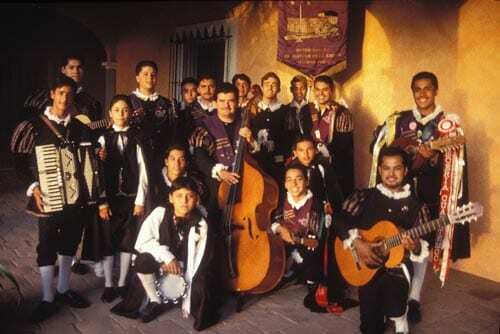 The Alamos “Estudiantina” has performed throughout Mexico, as well as in Arizona and California. Each year Alamos hosts a week long International Music Festival showcasing classical music with the participation of world renown artists from México, Brazil, Argentina, Cuba, Germany, Sweden and the United States. The Festival honors the Opera Singer, the Alamense Tenor, Dr. Alfonzo Ortiz Tirado. The festival is organized by the Sonoran Institute of Culture, The National Council of Culture and the Arts, and The National Institute of Fine Arts in cooperation with the municipal seat of Álamos. 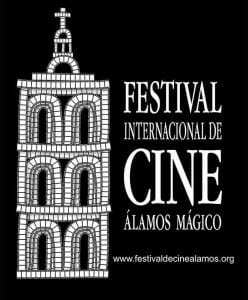 The Festival Internacional de Cine, Alamos Magico (FICAM) principal objective is to share new expressions of cinematographic art, emphasizing documentaries inspired by Sonora and the borderlands of northern Mexico. Supporting independent film makers of Mexico and Latin America by offering workshops for Film students. Films are shown at venues throughout town including bicycle powered movies on the Plaza. Renown musicians accompany Doc Jones each year for a long weekend at the International Alamos Jazz Festival, a joint venture with Sister City, Scottsdale, Arizona. Traditionally held early March. Doc Jones along with visiting musicians provide free music lessons at the Alamos Casa De Cultura for young people. 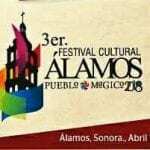 The annual three day festival celebrates Alamos, the “Pueblo Magico”, with major music venues, shows of historical photographs, architectural workshops, as well as displays of local arts and crafts. A delightful culinary experience held in the Fall each year. The light in Alamos, Mexico is ideal for painting, especially in the winter because of the consistent light. You can put down your brush and return the next day to the same natural tones. Artists make Alamos their home. Painters, photographers, sculptors, and crafts people find inspiration in the architecture, the colorful vines and the greens of the surrounding hills. Groups join to share techniques, paint and sketch. This regional museum was inaugurated in 1984, to rescue, preserve and acknowledge the historical culture of the area also serves as the city’s cultural center. Hosting many Art Shows throughout the year as well as sponsoring workshops in Paper Mache, Sculpting and Painting. Perched on Loma de Guadalupe is the Historic Old Jail converted to a Cultural Center offering ART and Music classes plus Salons for Art Openings. Plaza de Armas is often graced with impromptu art shows by local artists and crafts people. art events on the Plaza de Armas. Strolling ‘Mariachis’, stilt walker performers, art exhibits, and more bring the whole town to the Plaza on Saturdays throughout the year.